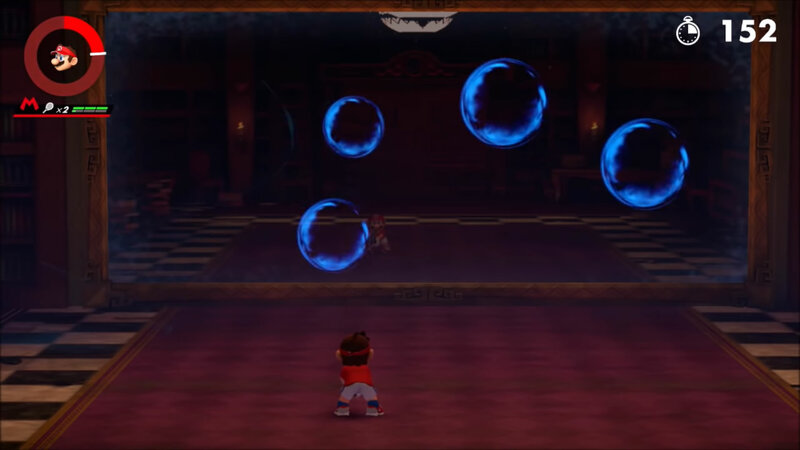 One of the first considerable challenges players will face in Mario Tennis Aces centers around the giant mirror featured in the Reflection Room. Mario Tennis Aces made its proper debut just earlier today, and players are already jumping into the game's hot tennis action. However, many gamers are already being surprised by the title's depth, not only due to the game's different shot types and special moves, but also because of some of the various puzzle challenges. One of the first that seem to be stumping strikers is the Great Mirror Mystery Reflection Room puzzle, and fortunately, we know how to beat it. The Reflection Room puzzle opens up with players facing a mirror. Within the mirror, players will see a bunch of different blue bubbles, and it's clear that the players are meant to hit them with accurate shots. What's unclear is which bubbles the players are supposed to be targeting, and with a countdown clock ticking away, this can lead to some frustration. Fortunately, the answer is pretty simple once players know the trick. Any time a blue bubble is hit, one of two different sounds can be heard. One of the sounds corresponds to an incorrect hit, while the other — kind of a plink sound — will denote a correct hit. Hit balls at various bubbles and note which one makes a different noise from the others — this will be the bubble to target. Once the correct bubble has been hit, a star will appear on the ground, allowing players to use a Zone Shot. Make use of the Zone Shot's ability to slow down time to deliberately target the correct bubble. Once it's hit, the bubbles will clear, and more will appear in their place. Rinse and repeat this process twice more (for three times total) to move on to the next part of this challenge. After the bubbles are cleared, the mirror will begin to reflect a purple-hued clock as well as a number of moving gears. This part isn't nearly as tricky, though it can be more challenging — simply aim shots at the gears and take them out. Clearing one set of gears will make another set appear, with each set moving more quickly than the last. Eventually the gears will be moving so quickly that players will have to use their Zone Shots to aim the ball to where they anticipate the gears will be, not necessarily where they are at the time. Again, complete this process three times, and the challenge will be over. Once the puzzle challenge has been completed, players will move into a separate stage for a fresh boss battle. Don't worry about failing it, though — even if the battle is lost, players won't have to return to the Reflection Room. Our coverage of Mario Tennis Aces has only just now begun. Players who want to keep up on the latest information would do well to check out our guides on how to pull off trick shots, plus we've got a detailed writeup of all the characters featured in the Mario Tennis Aces roster, including information about their play styles and individual traits.